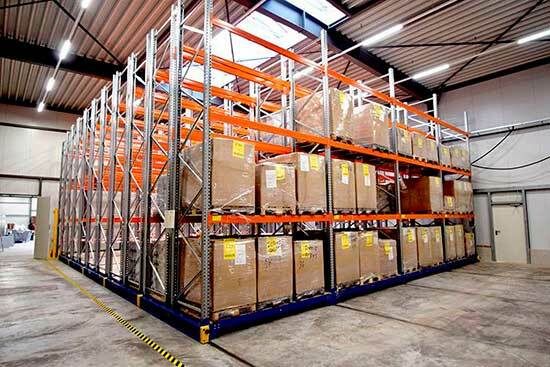 Mobile pallet racking (AR Mobile) is a system where the pallet racks are placed on chassis or mobile bases guided through fixed tracks on the floor. 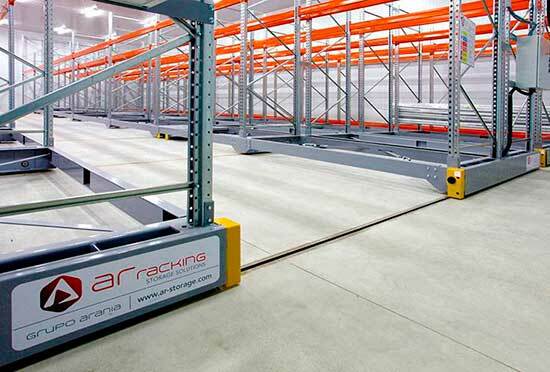 The base of this type of racking is equipped with an electrical motor and remote push-pull elements allowing the racks to move along the tracks in order to open only one forklift access aisle. 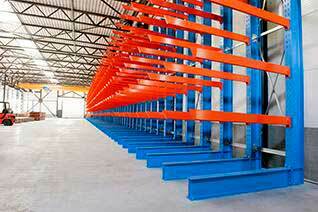 Mobile pallet racking is a high density storage system, providing simple access for conventional forklift pallets. Its versatility permits its adaptation to both the load type and the type of forklift. A series of technical and organizational protective measures are in place to ensure that the movement of the shelving does not pose a risk. 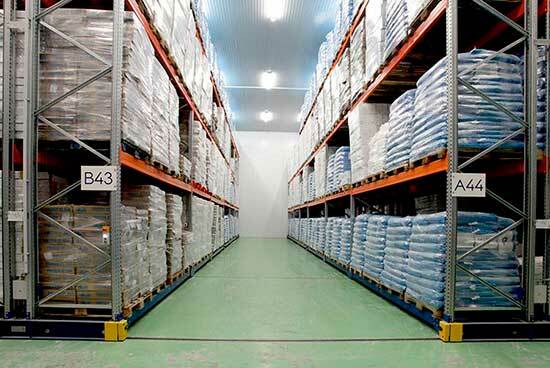 The features of the AR Mobile racking system make it the ideal storage system for cold storage and deep-freeze units, thanks to the reduction in the total volume to be cooled. 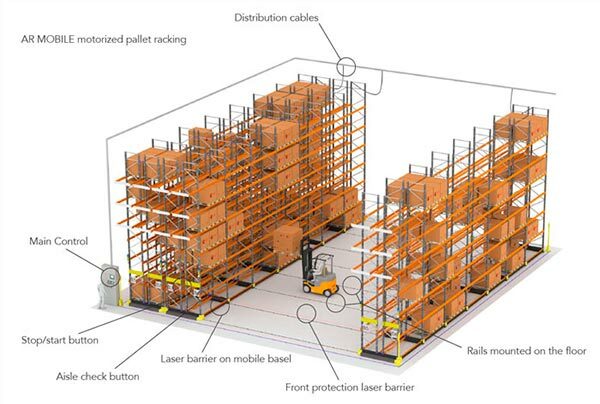 The AR Mobile bases system is designed to compact the shelving facility and significantly increase warehouse capacity. 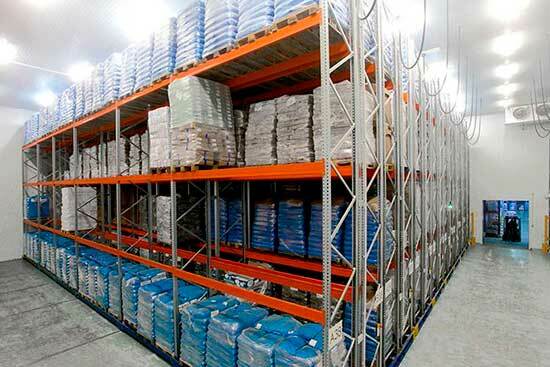 This is a high density system as the individual access aisles found in conventional racking systems have been eliminated, leaving just one aisle. 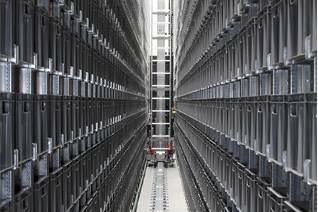 The aisle to be accessed for work is automatically opened using electric motors and moving components fitted on the base of the racking. The operator gives the order to open via the remote control. As this is a compact system, the surface area occupied by the storage system can be reduced. Perfect when the cost of floor space is high or when it is necessary to increase the storage capacity but not possible to increase the surface area. 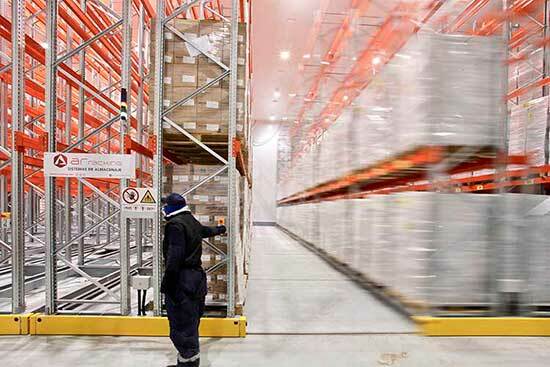 The application of the Mobile pallet racking system reduces the total volume of the installation, making it essential for use in refrigerated and freezer chambers at medium and low height. The savings in energy help to quickly pay off the installation. It has a main control, laser-barriers in the mobile base and bumper bar, guide tracks on the floor, a start button and an aisle verification button. The mobile bases racking system is especially recommended for low and medium height cold and freezer chambers. Simplifies access to all pallets. 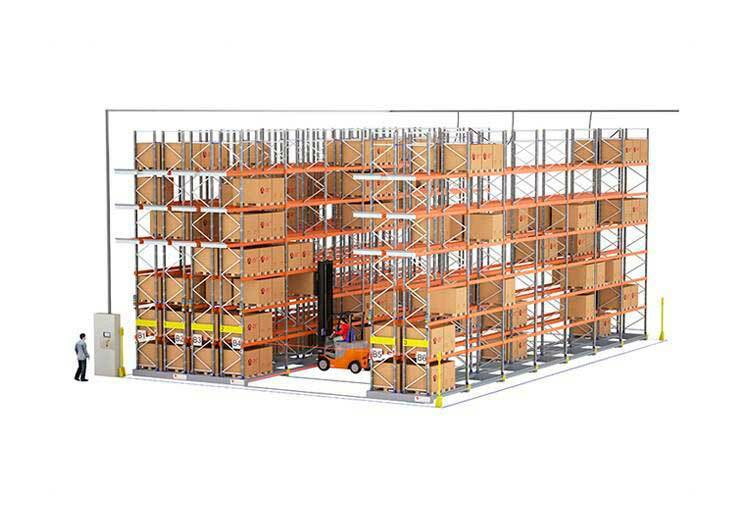 Industrial mobile racking adapts to any space, weight, or size of the goods, and is compatible with other automatic or conventional storage systems. Energy savings: control of lighting and reduction of space to be cooled. Only the aisle that is open is lit. Once the rack is fully loaded, the lighting for that row is automatically switched off. Direct access to any stored pallet, implying a saving in time. Perfect for Refrigeration chambers or deep-freeze units thanks to the reduced volume to be cooled. It also permits air circulation. In the “night-time configuration” mode, all the aisles of the installation open automatically and uniformly, with an identical but reduced width between each one. This helps to improve air circulation within the refrigeration chambers. Reduction of times for manoeuvre and displacement with the forklift, using the remote control to select the aisle required for work. Adaptable to any space, weight or size of product to be stored. Allows picking work to take place at lower levels. Compatible with other automatic or conventional systems. 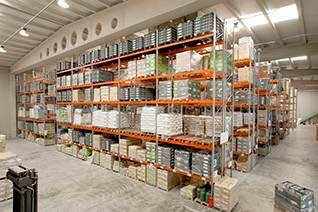 The forklift truck type used in adjustable pallet racking zones can still be used here. The struts and frames from the AR range are pre-galvanized.